From Lincoln City head north on Hwy. 101 to Hwy. 18. Travel east on Hwy. 18 to milepost 3.96. Exit Hwy. 18 and travel south on Bear Creek Road 0.9 mile. The bridge is located on the left. The Drift Creek Bridge has a long history. Originally built south of Lincoln City only 1.5 miles from the coast, the bridge was considered the oldest remaining covered bridge in Oregon. The span once served traffic on a main north-south route along the Oregon coast. New roads and highways were built later, thus diverting most of the traffic from the now remote site. When the bridge was built in 1914, the community surrounding the bridge site was known as Lutgens, and in 1917, the name was changed to Nice. In all, at least eight name changes occurred in this community prior to the closing of the post office in 1919. 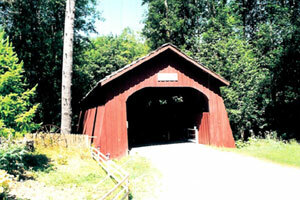 After the bridge was bypassed with a concrete span in the mid-1960s, Lincoln County passed an ordinance preserving the wooden structure as an historical memorial to the Lincoln County pioneers. However, in early 1988, Lincoln County officials had to close the Drift Creek Bridge to pedestrian traffic due to the deteriorating condition of the span. Excessive rot and insect damage had weakened the bridge to a dangerous level. Steel beams were installed inside the bridge to keep it from falling into the water. The area around the bridge was excavated in an effort to isolate the structure and limit access. This bridge was dismantled in late 1997. The County gave the timbers to the Sweitz family who owned land only eight miles to the north of the original site. Laura and Kerry Sweitz had envisioned the house being rebuilt over their concrete bridge that provides access to their property across Bear Creek. In the pioneer spirit that this bridge represents and through hardship and strife, their monumental efforts resulted in the resurrection of the bridge which now stands in a small, beautiful park-like setting.